Articles posted by "Bo Wandschneider"
Last week, April 8, marked a significant milestone in an important initiative – the Canadian Shared Security Operations Centre (CanSSOC). I am happy to announce that the CanSSOC website is now available. I encourage you to check out this informative communication resource that covers CanSSOC’s objectives, deliverables and benefits. CanSSOC (a proof of concept) was developed to investigate the frequency and complexity of cyber security threats facing higher education institutions. This is truly a shared investment and collaboration between six partner universities (University of Alberta, University of British Columbia, McGill University, McMaster University, Ryerson University and University of Toronto). We are also working closely with our NREN partners, CANARIE, BCNET, CYBERA, ORION and RISQ. Together, we are making online safety and security a top priority at higher education institutions across the country. A shared security operations centre will yield benefits such as rapid response time, increased staff retention and enhanced security. The estimated completion date for the CanSSOC project is January 2020. I encourage you to check the website often for new information and subscribe to receive project updates. The UnITe 2019 Conference is only few weeks away – May 1-3 at University of Toronto’s beautiful and historic St. George campus. There is still time to register, the deadline in April 24. Sign up today! Don’t miss your chance to meet with IT colleagues from across the province, catch our keynote speakers – Canadian icon, Douglas Coupland and health care leader, Dr. Kamran Khan. Read more about our featured speakers. Thank you for your participation and support of both of these ground-breaking initiatives. See you in May! I am chairing an innovative conference, UnITe 2019, some may say we have created a unique opportunity this year. The conference is taking place on the beautiful University of Toronto, St. George campus, from May 1–3. What differentiates UnITe 2019 this year is the merging of three distinct events that serve diverse communities into one major celebration of learning and partnership. UnITe 2019 combines a long-standing University of Toronto (U of T) internal event, Techknowfile (TFK). TKF is rich with tradition and has a focus on service leadership, continuous education and information sharing. The Ontario Higher Education Information Technology (OHEIT) conference is the place to be every year to network, socialize and be part of an innovative program that is for the people, by the people. Last but not least, U of T is partnering with Ryerson University to highlight the importance of staying safe online in today’s ever-changing global landscape. Whether it’s phishing, cyber crime or the importance of protecting your data while travelling for a conference, cyber security is a hot topic that garners a lot of discussion. Together, we present Ryerson University Cybersecurity Day (RUCD). Do you have an interactive, innovative and engaging workshop or session to share? We are looking for proposal submissions, they are due March 15. And more… Information on registration and much more will be live shortly, please visit UnITe 2019 often. I invite you to join us in community, service and partnership. See you in the spring! I am pleased to invite you to visit UnITe 2019 and register today. Looking forward to catching up with you and seeing our partnership in practice. The ITS leadership team celebrated the end of a successful year and upcoming holiday season with 140 people at the Faculty Club. People that made and continue to make a difference at the University of Toronto. They contribute to making life – teaching, learning, research and working together – easier, more efficient and highly-connected for staff, students and faculty. From ACORN to Quercus – ITS delivered in 2018. In between the festive treats and catching up with the ITS team, the subject of values came up. Actually, I asked the questions to those gathered. What ITS value resonates with you? What behaviours support these values? And contrarily, what actions are outside of our values? Definitely food for thought as we venture into the next leg of our IT@UofT journey in the new year. Earlier this spring, we shared the values that were developed by the ITS team. We continue to see them demonstrated at U of T and ITS in particular, and they matter. I continue to receive positive feedback about the people in ITS, and most of them tie back directly to our values. The values seem to resonate, are straight-forward and can be used as a compass. The following quote simplifies this: “When your values are clear to you, making decisions becomes easier.” – Roy Disney. Learn more about ITS core values and watch the 2018 year in review video montage to see our team living their core values every day. If you have stories to share about you or your team demonstrating the ITS core values, reach out to its.eda@utoronto.ca, and don’t be shy about calling out people who live into their value – use the True Blue award or our team site. Thanks for a great year – it is an incredible pleasure to work with such talented and dedicated people. Fun, food and festivity! The Information Technology Services (ITS) team celebrated its annual Holiday Social on Dec. 13 at the U of T Faculty Club. 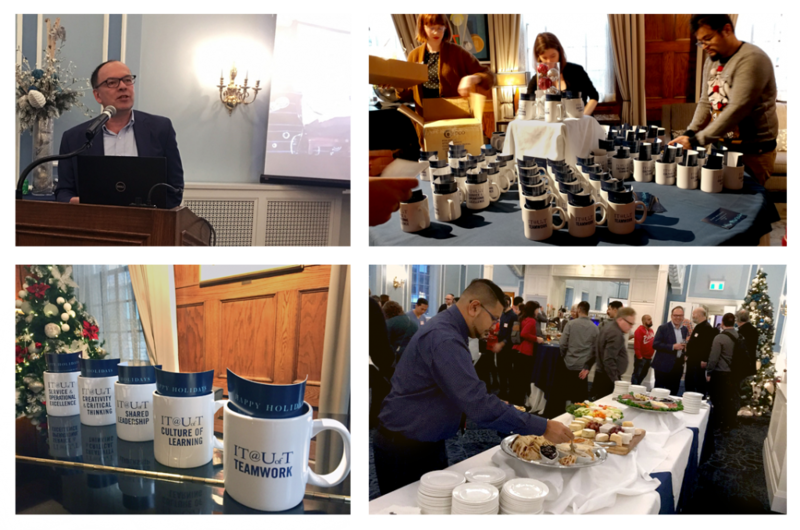 Pictured clockwise from top: CIO Bo Wandschneider reflects on 2018, congratulating ITS staff on their many accomplishments; party prep; holiday mugs represent the five ITS core values; staff enjoy appetizers and socialize at the Faculty Club party. Since the summer, we have been focused on leading the Information Technology Services (ITS) strategic planning process. The plan, once developed, will forge the direction for IT at the University. Strategic objectives and initiatives will focus on ITS. The vision, pillars and guiding principles are resonating with the rest of the University community. They can use this to help shape their own direction and plans to better enable alignment. We are hearing a strong desire to work more collectively and collaboratively and the notion of IT@UofT is resonating. That is why it was so important to hear the voices, experiences and stories from the divisional/faculty IT partners, valuable colleagues in other areas across all three campuses, in addition to our community within ITS. Over the summer, we used the visioning input from over 250 members of the community to lay the foundation of our vision, pillars and guiding principles. During the fall term we vetted this at multiple meetings and a roadshow of sorts (information sessions, consultations, community engagements, steering committee meetings, workshops and more) with members of the community including stakeholders, staff, students and faculty. To date, 613 people participated in the myriad of phase 2 – community consultation activities. The best part of this stage was meeting people and hearing their fresh ideas about the vision, strategic pillars and guiding principles that form the foundation of the plan. It was also a wonderful learning experience with 72 digital moments/stories created. These stories looked three years into the future and projected how IT can help enhance life for students, staff and faculty. I recently presented the concept and workshop, along with Gayleen Gray, AVP IT at McMaster University, to our CIO peers across Canada and it was a lively session with positive feedback and a desire to create their own digital moments. I’m eager to share our digital moments with you. Stay tuned. Transparency and two-way communication is key to the work that we do and provides insight in how we can do better and continuously improve. This phase was no different. Throughout the process we welcomed questions and feedback and community members’ thoughts on envisioning the future. The digital stories part was especially good. It was nice to see active contributions from some of the less vocal members of the community. I think the overall approach was helpful and engaging – especially in this stage of the process. I am interested in seeing how this evolves over time and what kind of consensus is reached. Kudos on really engaging activities to get us thinking about the language and vision of the process. Really enjoyed them, especially the digital moments one. I think these are great relationship building exercises that help disrupt stereotypes and strengthen community. Next steps include ITS leadership meetings, steering committee meetings, a few more community meetings and finalizing the vision, strategic pillars and strategic initiatives. Thanks to those who have participated along the way, your involvement is crucial to the success of this plan. Learn more about IT@UofT and upcoming phases and milestones. I’ll be sure to provide updates as the plan progresses. September 1st arrived. With that date, students were preparing to move into residence and go back to class, faculty were setting up their courses and the tri-campus was full of life and activity. September 1st also signified a milestone in the Information Technology Services (ITS) division and the rest of the University community – the transition of all courses from Portal to Quercus. After three years of planning, extensive community consultation and comprehensive training Portal was decommissioned and Quercus went live. The change was significant and it happened without major issues. There were a few minor technical matters and they were promptly addressed by the Quercus team and Instructure, our valued delivery partner. As new issues arise, we will continue to respond and improve the service. Key to the accomplishment of this initiative was community engagement. People from all areas of the University were consulted, trained and engaged. This effort was truly institution-wide and touched every corner of our three campuses. 191 training sessions were lead or co-lead by the Center for Teaching Support and Innovation. 109 centrally supported content migration clinics took place. Additional training sessions were run by over 60 technical and training leads embedded in 23 divisions. Over the last 10 months a total of 47 divisional meetings and information sessions took place reaching 833 people. There were 46 departmental meetings with 925 attendees. Regular update emails (20) were sent to 100 key contacts across the U of T.
The reach of Quercus is significant with over 71,000 students logging into about 4,700 courses, with over 4,500 individuals in instructor roles –all within the first week of classes. There are still training opportunities available until the end of 2018 and I encourage you to sign up for a webinar. Much easier to move from one course to another. Love the syllabus feature and it updates the calendar – and students love the calendar. Social media comments are optimistic too! Overall, the move from Portal to Quercus was a success. On October 15th, over 50 project and steering committee members came together to mark the achievement. To learn more about this project visit the website. Core team and steering committee members celebrate at the October 15th, celebration luncheon.